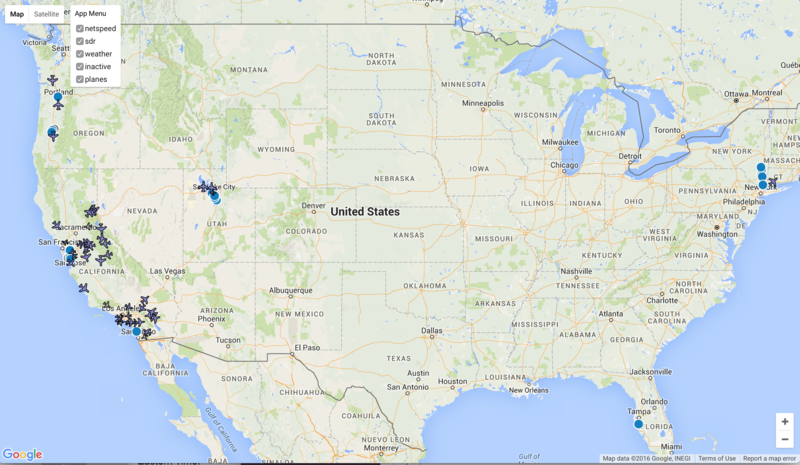 On the global map you will see blue and gray dots for each device participating in one of our experimental Insights. Currently all of these devices are Raspberry Pi devices. Note that blue dots represent devices on Horizon that have recently sent data. Gray dots represent devices that have at some previous time sent data, but not recently. That is, gray dots represent inactive devices which may be permanently shutdown, or perhaps are just temporarily severed from their network connections. Notice also that the top left menu allows you to select only dots that are participating in specific Horizon Insights, and you may also select whether or not to show inactive dots on the map. 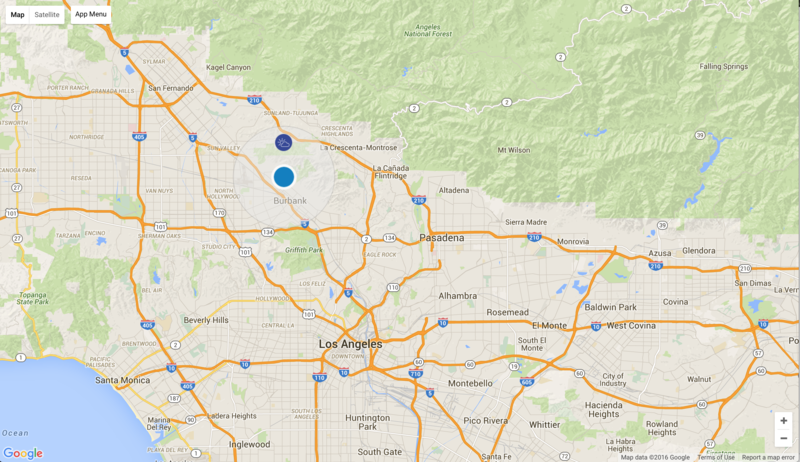 If you have a device on Horizon then drag and zoom the Google Map to find your blue dot. You can hover over the device to see the number of contracts running on it. Select the dot for your device (or any blue dot) and you should see a translucent circle appear around the dot, as shown in the example below. The blue dot shown on the map near Burbank, CA in this screen capture has been tapped and the translucent selection circle is now showing. In the translucent selection circle you will see one or more icons. In the example above only the Personal Weather Station icon (a sun and cloud) is showing, indicating that this device is only participating in the Personal Weather Station Insight. If you click on a device's weather icon you will be forwarded to a dedicated Personal Weather Station page for that device, similar to the one shown below. 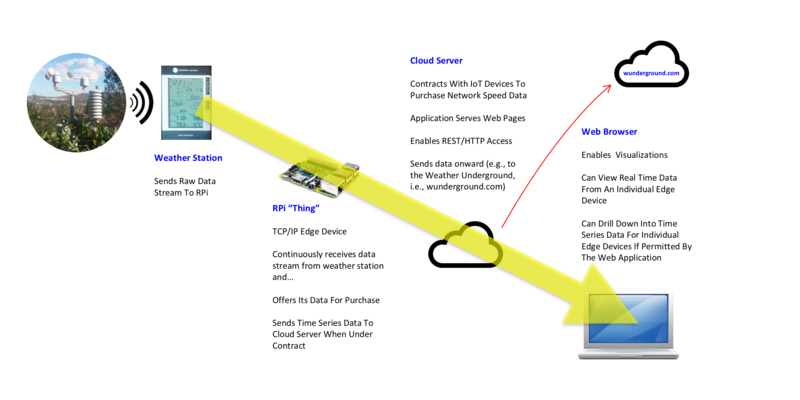 Horizon enables streaming weather data from a variety of PWS (Personal Weather Station) sensor arrays that are currently not directly supported by the Weather Underground. Weather data from most PWS sensor arrays is transmitted to an included base station using a variety of protocols. Without Horizon, a base station would require a computer connected to the PWS running software to collect real-time weather data to upload to a cloud consumer like the Weather Underground. 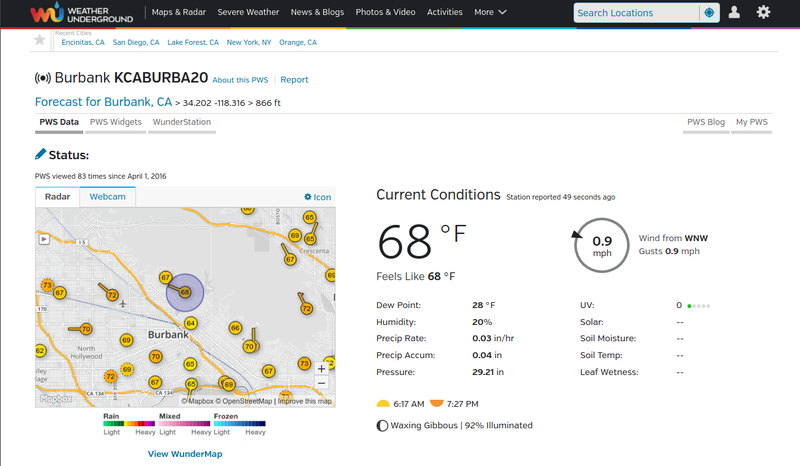 To enable streaming weather data without Horizon, a PWS would also first need to be registered on weatherunderground.com and issued a Station ID with credentials under a known user account. Purchase a Raspberry Pi and associated supporting hardware. Set up device according to the instructions. 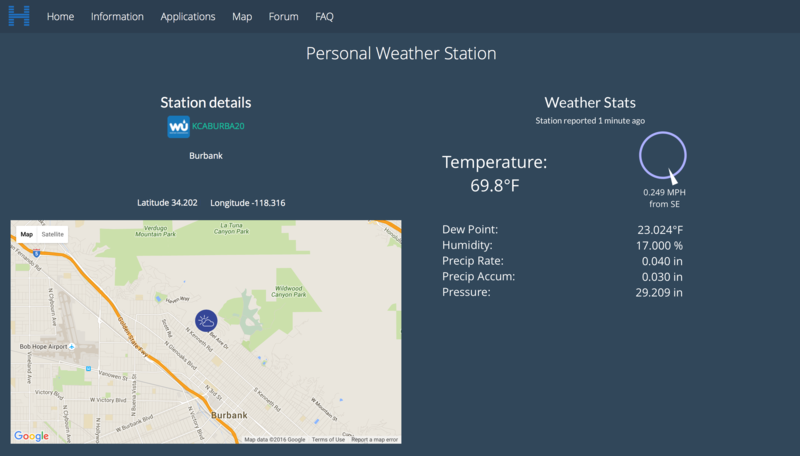 The Horizon Personal Weather Station workload on the Raspberry Pi is comprised of a few Docker containers which manage the PWS registration process and streaming data connectivity between the PWS and the cloud. The firmware container uses Python-based WeeWX software, packaged into a Docker container, that recognizes the PWS base station and publishes data locally on the Pi. Horizon also runs a message broker container, based on MQTT, that streams this data from the PWS to the cloud.